Many people believe (as we once did) that veganism is restrictive, difficult, boring—and reserved for longhaired, Birkenstock-clad hippies. 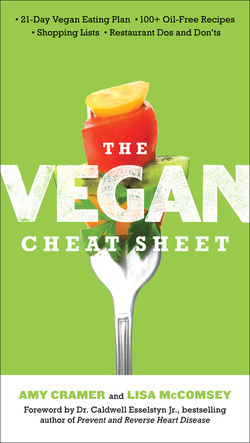 But The Vegan Cheat Sheet—written by a renowned Boulder-based vegan chef and entrepreneur and an established New York City writer—sets out to prove that ditching animal products is simple and delicious. The Vegan Cheat Sheet shows how simple and accessible veganism can be and focuses on how to live this great new lifestyle, step by step. Designed to be a take-everywhere guide, the book is compact enough to throw in a purse, a pocket, or a glove compartment. Have questions, concerns, or testimonials about going vegan? We'd love to hear from you! Click here to contact us.